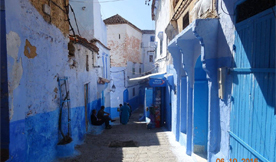 The tour starts from tangier then we will drive through the RIF mountains and by the city of Ouazzan famous with the typical Moroccan coat “JELLABA”.Later in the afternoon you will attend the sunset in the outdoors of the blue city CHEFCHAOUEN the icon of the RIF. 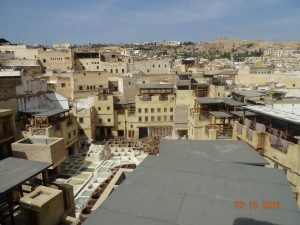 Overnight at your riad in Chefchaouen. We will make up early in the morning, to watch the best sunrise of your life, casting different shadows and colours,over the the sea of sand dunes, the highest in Morocco, before returning to our desert hotel.After breakfast,We will continue to Tinghir, and the stunning Todra Gorge the highest, narrowest gorges in Morocco.The gorge, is a great spot for hiking and relaxing on the edge of the river,or sampling some local Berber delicacies.After lunch in the heart of the gorge, we’ll drive through the Dades Valley,where we will end our day,spending the night in a nice hotel,located on the ege of Dades valley. 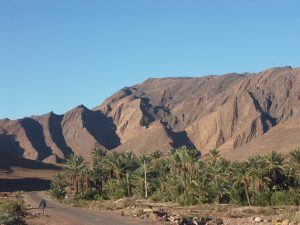 After breakfast in the hotel, we’ll drive through the Dades Valley,towards Kalaat Mgouna and Ouarzazate. 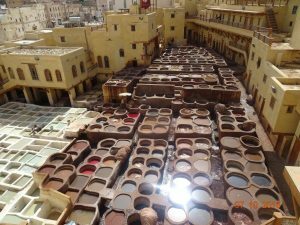 The route through Dades Valley, is“ the Route of 1000 Kasbahs ”.then We’ll drive through “the city of roses”,which is known for the production of the rose water.Our journey will Continue to Ouarzazat, “the Hollywood of Africa”.After lunch,in the famous Ait Ben Haddou kasbah,(the UNESCO heritage site since 1987)and the largest Kasbah in Morocco,many movies have been filmed there, including The Mummy, Gladiator,our journey,will continue through the major haighest pass in Africa (2260m), over the High Atlas Mountains, before arriving to Marrakech, where the tour ends. After breakfast, transfer to Marrakech Airport for your departure flight.